Fountain pen or fountain pens no matter how many you own or have used this handmade in Ireland Shannon Fountain pen will stand out in any collection or it will make a stunning totally unique gift you want to give to that special person in your life......... Pen Facts: .....>FREE Desk stand.....>We will have this pen in the post to you within 3 working days of your order .....>Irish Elm for the midlands of Ireland .....>High Shine hard wearing finish..... >Chrome Trim with gold accents .....>145mm Long capped ....>134mm long uncapped .....>18mm at widest point .....>60 grams .....>German Iridium Tipped size 6 Nib .....>Ink pump so you can use your favorite ink .....>Pen takes international standard ink cartridges also .....>Peter Bock German manufactured size 6 nibs are also available for this pen. (Bi-color 23k Gold Plate and Polished Steel) .....>Presented in a velvet double pen case Super writer and feels so comfortable in the hand for such a substantial pen, it will be noticed every time you use it. 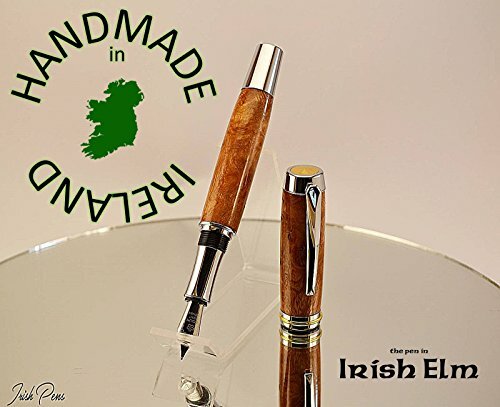 Because of the Irish grown wood in the pen one client said, "It's like holding a little part of Ireland in my hand every time I hold the pen"
If you have any questions about this product by Irish Pens, contact us by completing and submitting the form below. If you are looking for a specif part number, please include it with your message.